Winston Churchill very much became the symbol of England standing fast in the face of the scurrilous Third Reich, and that symbol is paid homage by Joe Wright as his predominantly intimate opus “Darkest Hour” begins. We are dropped into a House of Commons quarrel where impassioned verbosity The Opposition forces lily-livered Neville Chamberlain (Ronald Pickup) to resign. As this transpires, Wright’s camera settles on a chair that is empty aside from a bowler hat, overtly laying down the myth of Churchill before we even see him. 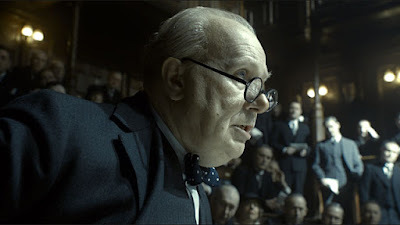 Indeed, not long after typist Elizabeth Layton (Lily James) finds herself in Churchill’s residence, being given explicit instructions on the new Prime Minister’s bellicosity and eccentricity, the myth being furthered, and when she is finally ushered into his room, she finds it cloaked in darkness. Suddenly, Churchill appears by the light of his match as he ignites his cigar, that other infamous totem, sitting up in bed, all alone. Alone is the operative word. That is what the first half of “Darkest Hour” seeks to make rather clear – that in those early days of WWII, Winston Churchill, and, by extension, England, was all on its own. Stop me if you’ve heard this one before: it is May 1940 and the English army has been driven to Dunkirk, hoping for evacuation, praying for a miracle. The war cabinet, and in particular Foreign Secretary Lord Halifax (Stephen Dillane), fearing the totality of their armed forces will be lost, wants to initiate peace talks with the Third Reich, but Churchill wants to find means to generate the miracle, though one does not seem readily apparent. In the course of this familiar drama, however, Wright refrains from showing us the beaches of Dunkirk, and we only get only one glimpse of the famous civilian fleet enlisted for the rescue while the Nazi menace is defined by a single shot of Hitler overlooking a battle map. No, “Darkest Hour” wants to keep us firmly in the headspace of Churchill as, teetering on the brink of calamity, he is forced to navigate the fine line between honesty and fibbing by means of a brave face, limiting the action almost exclusively to his residence and war cabinet rooms. At times, Wright seems to cast Churchill as deity, such as when the commander at Calais, where English troops are drawing fire away from Dunkirk, receives from the Prime Minister a letter of encouragement. And as he finishes reading, he looks up toward the heavens, partly so Wright’s camera can pull up, up and up, into the sky to find the Lutwaffe soaring overhead, but partly to evoke the idea of Churchill as celestial caretaker. This mythos is further over-emphasized in how Dillane plays Lord Halifax, Churchill’s foremost English antagonist, with one insistent note, sitting rock still, his head sloped disapprovingly downward, his eyes tilted disapprovingly upward. Against this, Churchill can only be right, right? He is, of course, and too often rather than finding means to offset the benefit of hindsight, “Darkest Hour” just sort of plays right into it. This lack of social grace plays into the character’s isolation, and that isolation is the biggest hurdle the screenplay sets for him to overcome. England can be an island in its defense, quite effectively so, but a man cannot, and rather than refashion transparency to lead his country into war, he must appeal directly to the people, and he must listen to their voices. 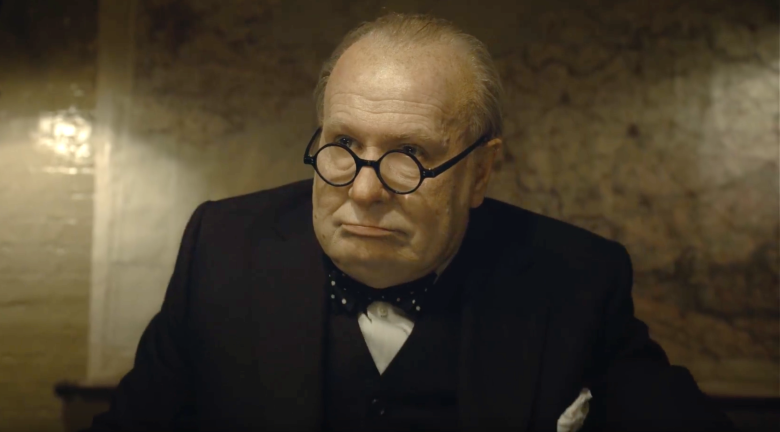 And that is where “Darkest Hour” really goes wrong in a single lengthy sequence meant to elicit Churchill’s transformation that I imagine will be dissected for years to come. This occurs as the payoff to a not-so-cleverly planted setup involving Churchill never having ridden the subway where, on his way to cabinet meeting, he skips out on his driver to take the subway instead, suddenly finding himself surrounded by The People. The sequence, while not true itself, is apparently based somewhat on reality, though the plausibility wasn’t what concerned me, nor was the inherent hokeyness. No, what concerned me was how, because of the movie’s intense focus on Churchill, this becomes his one scene, outside a few platitudinous exchanges with his wife and typist, when he looks through the looking glass the other way. Writer Anthony McCarten, however, cannot fashion real people from these subway riders in this limited amount of time, making them all mere types, and what’s more, because they realize they are in the company of Churchill, they find themselves spurred on by him as opposed to them spurring him on. If it’s true that Winston Churchill became a heroic symbol of opposition, a spirited leader that the people felt they could count on, well, too often in the language of the “Darkest Hour”, he becomes something more akin to a cult of personality.